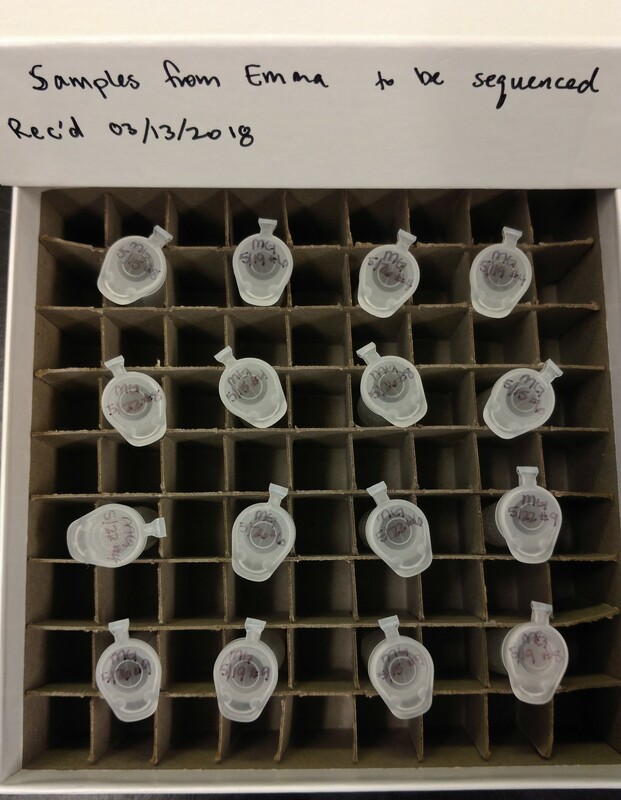 Received geoduck hatchery metagenome samples from Emma. These samples are intended for DNA isolation. Admittedly, I’m a bit skeptical that we’ll be able to recover any DNA from these samples, as they had been initially stored as frozen liquid, then thawed, and “supernatant” removed. I’m concerned that the freezing step would result in cell lysis; thus the subsequent removal of “supernatant” would actually be removing the majority of cellular contents that would be released during freezing/lysis. Use 1-4 mL total to wash front (and back if not obvious where biol material is) of filter while holding with forceps over dish – Use 2 pairs of forceps; I used 4 mL ice cold 50 mM NH4HCO3 to wash inside of filter (filters were folded in half). Washed filters returned to bags and stored at -80C. These are bacterial cells in ammonium bicarbonate. I spun them down and removed most of the supernatant from each tube. Let me know if you need any other info! Box of samples (containing ~38uL of liquid) were stored in FTR209 -20C (top shelf).